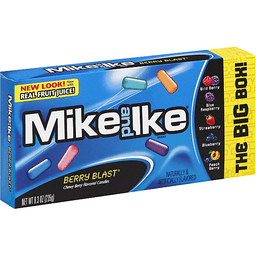 Mike and Ike Candies, Berry Blast, The Big Box! 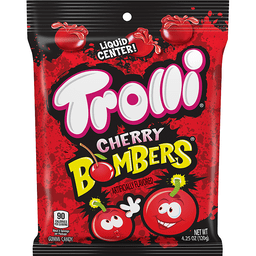 Chewy berry flavored candies. Naturally & artificially flavored. Wild berry. Blue raspberry. Strawberry. Blueberry. Peach berry. New look! Now with real fruit juice! Express your fruit flavor! We are together again! 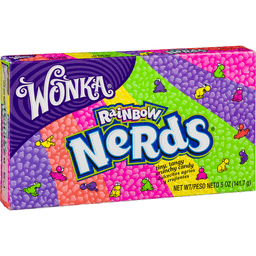 You are the reason we make great candy! - Mike and Ike. Facebook. MikeandIke.com. Gluten free. Printed using 100% certified renewable energy. 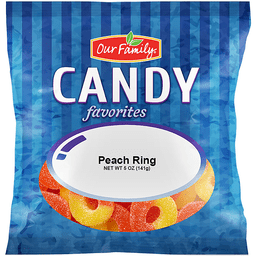 Satisfaction Guarantee: Quality candy is our family tradition. 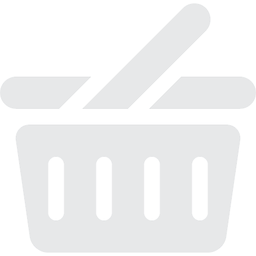 If you are not satisfied with the quality of this product, please save the unused portion and package. Contact us at 1-888-MIKEIKE M-F 9AM-5PM EST or www.mikeandike.com. 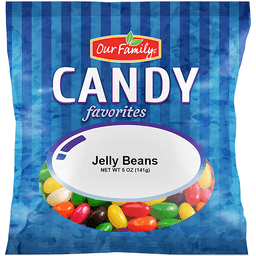 A great candy isn't made - it's Just Born. Made in the USA. Natural. 10% net profits donated. Fairtrade. Certified gluten-free. 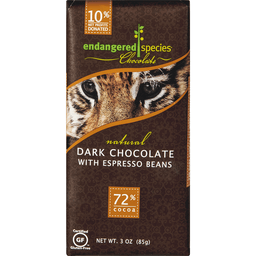 Our 10% Promise: By choosing this chocolate bar you are supporting conservation programs worldwide. 10% of net profits are donated to non-profit partners that protect and preserve wildlife. Look inside for info on the otto. 10% PCW. Learn more at ChocolateBar.com. Cocoa and Vanilla: Fairtrade Certified and sourced from Fairtrade producers. Sugar traded in compliance with Fairtrade Standards. Total 73.1%. Visit www.info.fairtrade.net. Product of the USA. Inspired by the chillest beverage around. Natural. 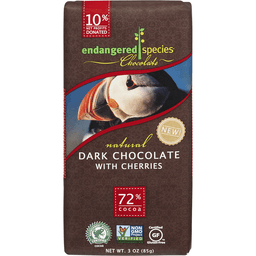 72% dark chocolate with cherries. Enjoy. Rainforest Alliance Certified cocoa. Non GMO Project verified. nongmoproject.org. GF: Certified gluten-free. 10% net profits donated. Ethical Trade: We buy our cacao from small family-owned properties, helping sustain the habitats and communities in which they exist. The Plight: To learn critical information about the plight of the puffin, please read the inside of this label. Our Promise: 10% of net profits are donated to help support species, habitat and humanity. You can learn more and shop online by visiting ChocolateBar.com. Certified vegan. 10% PCW. Product of the USA. 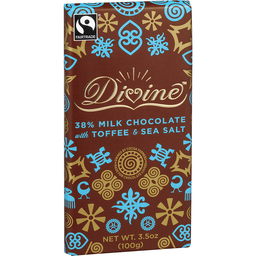 Divine™ Chocolate Bar Milk Chocolate With Toffee & Sea Salt. Fairtrade. Owned by cocoa farmers. Made for chocolate lovers. Net Wt. 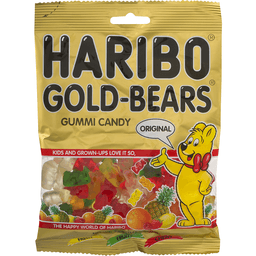 3.5 oz (100 g). 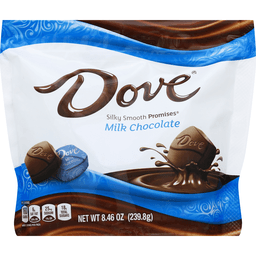 Cocoa solids 38% minimum in chocolate; milk solids 16% minimum in chocolate. Sugar, cocoa, vanilla: Traded in compliance with Fairtrade Standards, total 79% of the product's ingredients. Visit www.info.fairtrade.net. Halal Zertifikat®. www.halal-zertifikat.de. Read more about Divine inside this wrapper and discover the full Divine story, and many delicious chocolate treats at: www.divinechocolate.com. Have fun with your yum! 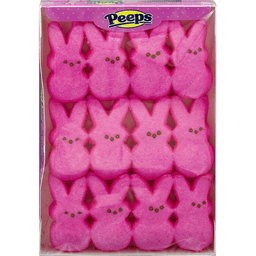 Per 4 Pieces: 100 calories; 0 g sat fat (0% DV); 30 mg sodium (1% DV); 17 g sugars. A fat free food. For more great recipe ideas visit Jetpuffed.com. Produced with genetic engineering. 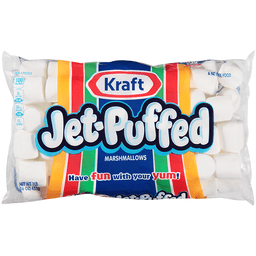 For more great Jet-Puffed recipes like S'mores and frozen rocky road cups visit: jetpuffed.com. 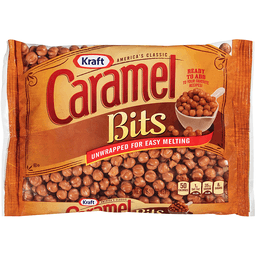 Visit us at: Kraftheinzcompany.com or call weekdays: 1-800-431-1001 please have package available. 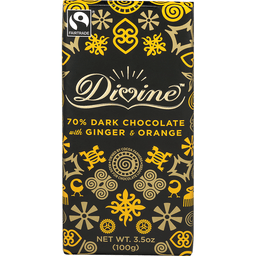 Divine chocolate is made with the finest quality Fairtrade cocoa beans from Kuapa Kokoo, a co-operative of small-holder farmers in Ghana. The cocoa is grown in the shade of the tropical rainforest, and slowly fermented and dried in the sun by the farmers, who take great pride in the chocolate company the co-own. You can read more about the Divine inside the wrapper, and discover the full Divine story, and the many delicious chocolate treats in the Divine range at: www.divinechocolate.com. Cocoa solids 70% minimum in chocolate. Cocoa, vanilla and sugar in chocolate: traded in compliance with Fairtrade standards, total 89% of product's ingredients. Visit www.info.fairtrade.net. Product of Germany. 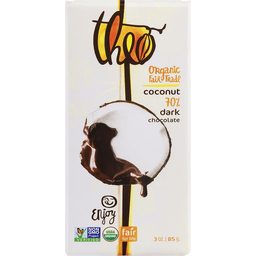 Theo Organic Fair Trade Chocolate Coconut 70% Dark. Enjoy. Non GMO Project Verified. nongmoproject.org. USDA Organic. Fair for life. 3 oz - 85g. Certified organic by QAI. Certified fair trade by IMO. Suitable for vegans. No soy. Toasted coconut in smooth dark chocolate - sweetly tropical. Make life sweeter. 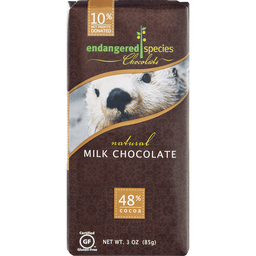 In choosing this chocolate bar, you join us in elevating the care of both people and planet. Our chocolate is extra delicious because we support training and education which enables farmers to produce higher quality cocoa. We pay farmers quality premiums that far exceed fair trade premiums, empowering them to invest in regenerative farming practices which renew and revitalize their farms. Our unique business model results in higher quality chocolate! 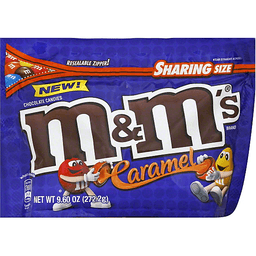 This chocolate connects you with people near and far. 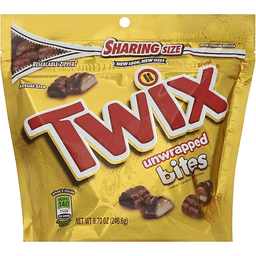 Enjoy, or share it with someone you love! Did you know that 70% of Theo's cocoa supply comes from the eastern Democratic Republic of Congo To learn more about this incredible place, and our bean-to-bar factory in Seattle, visit us at www.theochocolate.com. Design kittenchops.com. 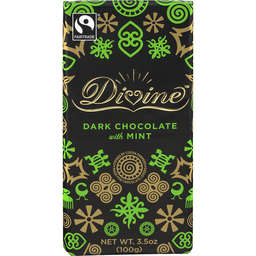 Divine™ Chocolate Bar 70% Dark Chocolate with Mint. Fairtrade®. Owned by Cocoa farmers. Made for chocolate lovers. Net Wt. 3.5 oz (100g). Divine Chocolate is made with the finest quality Fairtrade cocoa beans from Kuapa Kokoo, a co-operative of small-holder farms in Ghana. The cocoa is grown in the shade of the tropical rainforest, and slowly fermented and dried in the sun by farmers, who take great pride in the chocolate company they co-own. 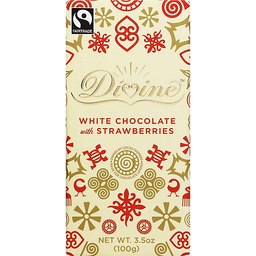 You can read more about Divine inside this wrapper, and discover the full Divine story, and the many delicious chocolate treats in the Divine range at our website. Cocoa solids 70% minimum in chocolate. Cocoa, vanilla and sugar in chocolate: traded in compliance with Fairtrade Standards, total 94% of the product's ingredients. Visit: www.info.fairtrade.net. Non-GMO Project Verified. nongmoproject.org. www.divinechocolate.com. Fair trade. Owned by Cocoa Farmers. Made for chocolate lovers. Divine chocolate is made with the finest quality Fairtrade cocoa beans from Kuapa Kokoo, a co-operative of small-holder farmers in Ghana. The cocoa is grown in the shade of the tropical rainforest, and slowly fermented and dried in the sun by the farmers, who take great pride in the chocolate company they co-own. You can read more about Divine inside this wrapper, and discover the full Divine story, and the many delicious chocolate treats in the Divine range at: www.DivineChocolate.com. Cocoa solids 25% minimum in chocolate; milk solids 26% minimum. Cocoa, vanilla and sugar in chocolate: traded in compliance with Fairtrade Standards, total 71% of the product's ingredients. Visit www.info.fairtrade.net. Imported from Germany. Recipes: Caramel Crunch Bars, Easy Caramel Apples, Caramel-Pecan Brownies. Milk chocolate. Peanuts. Caramel. Nougat. 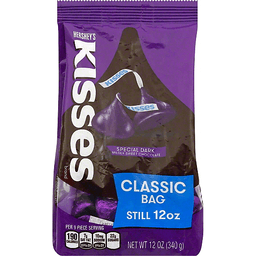 Resealable zipper! New look, new size! 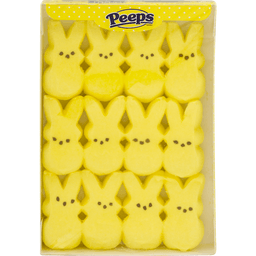 What's Inside: 190 calories (10% DV) per serving. 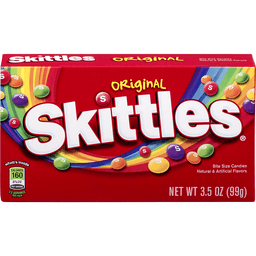 6 servings per pack. Take your bites anywhere! Everything you love. Nothing to unwrap. 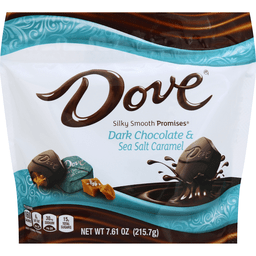 What's Inside - Per Serving (About 6 servings per pack): 190 calories (10% DV); 9 g total fat (14% DV); 3.5 g sat. fat (18% DV); 21 g sugars (No DV defined); 95 mg sodium (4% DV). GDA's are based on a 2,000 calorie diet. To learn more visit www.marshealthyliving.com. Partially produced in genetic engineering. Questions or comments? Call 1-800-551-0702. Mars real chocolate. 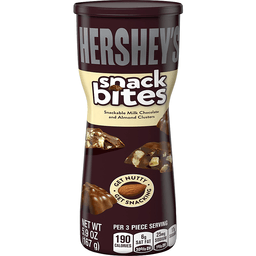 Hershey's Snackable Milk Chocolate and Almond Clusters Snack Bites. Get nutty. Get snacking. Per 3 piece serving. 190 calories. 6g sat fat, 30% DV. 25mg sodium, 1% DV. 17g sugars. Hearty, nutty clusters with just the right combination of crunchy sweet & salty satisfaction in every bite. 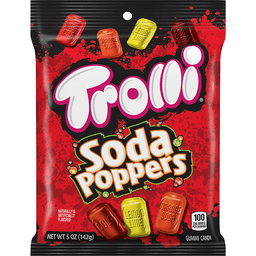 Great for at home, at work, or on-the-go snacking! Questions or comments www.askhershey.com or 800-468-1714. 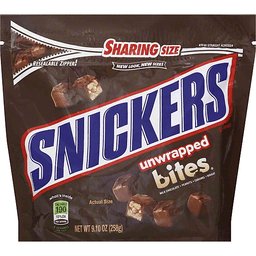 Visit us at www.hersheys.com.